Flybe has put itself up for sale, less than a month after issuing a dramatic profit warning. 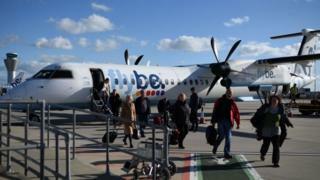 The Exeter-based regional airline’s board confirmed it was “in discussions with a number of strategic operators about a potential sale of the company”. Flybe said it was also examining “capacity and cost-saving measures”. Last month, the airline warned full-year losses would reach £22m because of falling consumer demand, a weaker pound and higher fuel costs. The Exeter-based airline is now valued at about £25m, far below the £215m it was valued at when it floated on the stock exchange in 2010. Stobart Group – which pulled out of a bid to buy Flybe earlier this year after the airline rejected its offer – could be a possible purchaser, according to Sky News. It serves about eight million passengers a year, but has been struggling to recover from a costly IT overhaul and has been trying to reduce costs. Last month, Flybe’s chief executive, Christine Ourmieres-Widener, said it was reviewing “further capacity and cost-saving measures”.